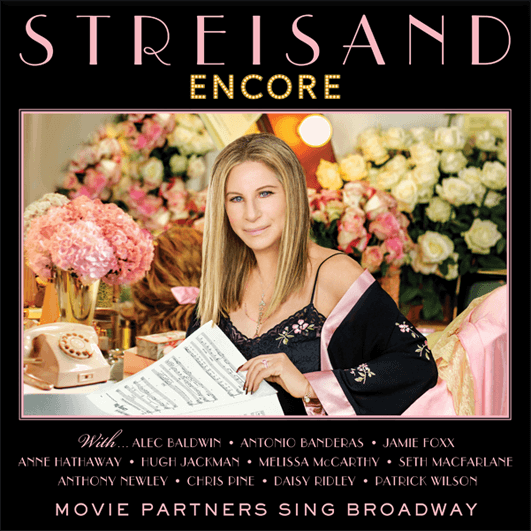 When I heard the thrilling news that Encore: Movie Partners Sing Broadway had gone to #1 in the US, UK and Australia, I thought about the title of Hillary Clinton’s book, It Takes A Village! I'm extremely happy to share this achievement with my brilliant movie partners: Alec Baldwin, Antonio Banderas, Jamie Foxx, Anne Hathaway, Hugh Jackman, Seth MacFarlane, Melissa McCarthy, Chris Pine, Daisy Ridley, Patrick Wilson, and my dear friend Anthony Newley. Also, special thanks to Bradley Cooper and my husband James Brolin for lending their speaking voices. Deepest appreciation to Rob Stringer, Joel Klaiman, Chris Poppe, and everyone at Columbia Records, who've given their time and talent to bring this music to the world. I’m very proud to call Columbia “home" for my entire career. Thanks also to Jason Iley and the great Sony Music UK team and to Denis Handlin and the great Sony Music Australia team, for all their belief in this album. I especially want to thank my own tireless team — Marty Erlichman, Jay Landers, Walter Afanasieff, Bill Ross, Dave Reitzas, Ken Sunshine, and Renata Buser for all their talent and dedication. Finally, as always, I want to thank the loyal fans who have continued to support my music through the years. I’m very grateful to all of you.